So many things in life are beyond your control. Couldn't your hair, at least, cooperate? If only. When frizzy flyaways or puffy texture interferes with your plan to rock a smooth hairstyle, tame those tresses with a few basic styling tools. Keep realistic expectations – some hair types lie flat more readily than others – but know that putting in a little extra time and effort can make a big difference. Dryness is one of the major reasons that hair won't lie flat. The outer layer of a hair strand, called the cuticle, has scales that resemble the bark on the trunk of a palm tree. When the hair is too dry, those scales lift and the hair absorbs moisture from the air. That creates the appearance of frizz. Getting hair to lie smooth requires coating the strands so the cuticles stay intact, and that requires plenty of moisture. Shampoo less frequently and use dry shampoo to banish greasiness between washings. Apply leave-in conditioner after washing the hair and start applying deep conditioning masks at least once per week. 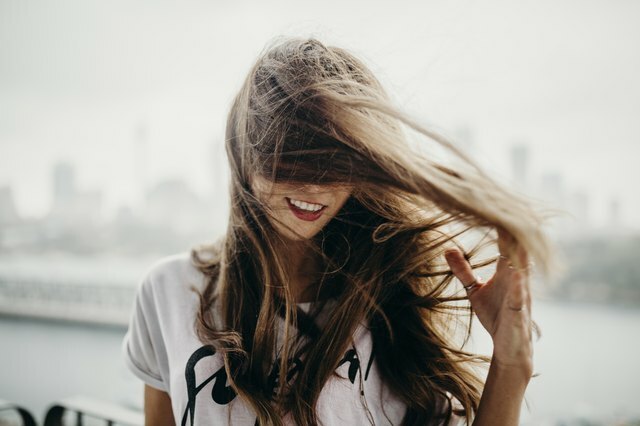 Hair that behaves perfectly during humid weather may reach for the stars once the air turns dry. When static electricity keeps hair from lying flat, weigh down the shafts by applying a little hair oil. Swap out any plastic brushes or combs for versions made of wood or metal. Spritzing a comb with hairspray before running it through the hair should also help tame it. In a pinch, grab a dryer sheet and gently rub it all over your head. Keep a pack on hand for quick smoothing sessions throughout the day. Get hair as smooth and sleek as possible with a blow dryer and a round brush. Attach a concentrator attachment to the dryer, which focuses the stream of air. Rub smoothing cream into your hair and rough dry it until it's just damp. Section off hair using clips and dry one small section at a time. Wind the hair around the brush and pull it taut. Point the blow dryer down the strands to smooth the cuticle. Finish by blasting each section on the blow dryer's cool setting. It's far from a quick fix, but sometimes the only way to get uncooperative hair to lie flat is to grow it longer. Longer hair is heavier than short hair, and that weight should pull some of the kinks and curls out of wild hair. If your hair is already long or is very curly or coarse, letting it grow isn't an effective solution – but for men and women with shorter hair, a few months' extra length may work wonders. Growing hair out is especially effective for taming or camouflaging a cowlick.